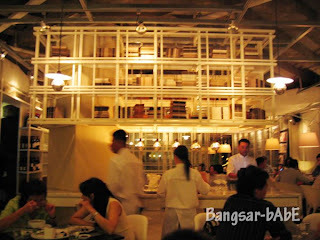 About 2 weeks back, rif took me to Alexis, BSC for dinner. Situated right next to Times Book Shop (where Esquire Kitchen used to be), it’s quite hidden at the corner so you’ll have to look out for it. 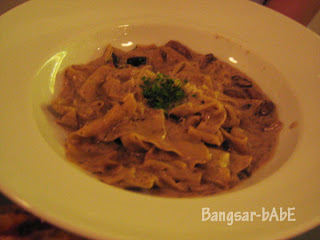 Jeen was raving about their Pappardelle with truffle oil so that was exactly what rif ordered. 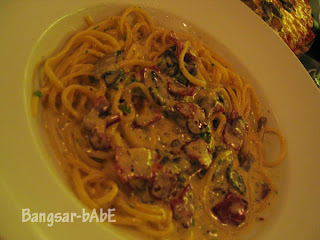 I had the Linguine Carbonara (it was actually Penne but I asked for a switch to Linguine). 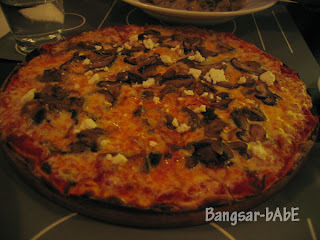 We also ordered the Al Funghi Pizza to share as we were pretty famished that night. The Parpardelle (flat ribbon pasta) was absolutely divine. Slightly creamy with tender mushroom slices, truffle oil and topped with grated parmesan cheese, it was unforgettable and well worth the price. I couldn’t tell whether there were bits of truffles as I have never eaten truffles before. Jeen, were there any truffle bits? Or was it just the oil? The Linguine Carbonara was pretty good but after the luscious offerings of the truffle pasta, this one only managed second place. Al dente Linguine generously coated with cream sauce, mushroom and bacon bits, it was the fusion of all my favourite ingredients. 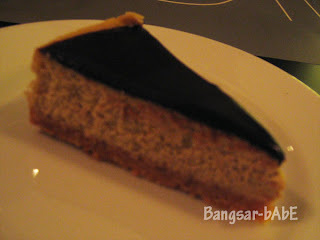 To round up dinner, we had a slice of Chocolate Banana Mascarpone as recommended by the waiter. An unusual blend of flavours resulting in a delightful slice of cake. Verdict: Nice ambiance and pretty good food. Not sure about the Asian selections but quite a few people ordered the Asian dishes while we were there. as is the pavlova, mmm….berries..
Well the cake was nice, but not something your want to eat everyday. Its a combination of different flavours. Unique. Well i think the pizza did not blow you away cause of the mushroom. I would prefer button mushroom on top or that mushroon we bought in UK. jeen: Yeah…I think I will try the tiramisu next. I find the Sarawak Laksa very expensive. It’s almost RM 20 a bowl!! wei jien: Okok…I belanja you eat something nice also la..what you want to eat?